In the amazing days of the Twenty-First Century, humanity has found itself reaching into the vast and mysterious universe and found danger. Who can keep the Earth safe in this time of cosmic change? 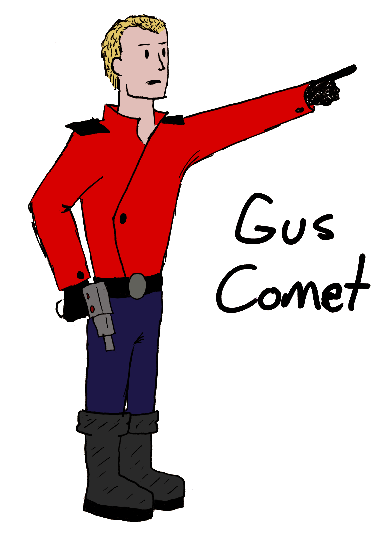 None other than Gus Comet, Rocket Officer! Soaring through the cosmos in his Rocketship, Gus Comet battles evil aliens, captures space criminals, and explores new planets of all kinds. Hooray for Gus Comet! Brains O’Brien, a scrappy rough-and-tumble super-genius orphan from Brooklyn. Hyram, a talking cyborg hyena who solves mysteries. And, Andrianna: Princess of the Robots. I don’t think that anyone can argue that the golden age of science fiction would be a bit disappointed about how the twenty-first century has turned out. I am the first to admit that we’ve got some great technology going on with out internets and our computers, but it is all kind of lazy technology. It’s the sort of technology that makes sitting around really great, but isn’t exactly the stuff of Adventure. I approve of sending robot drones to Mars and all that, but there’s no denying that the world would feel a little bit more special if we had heroic people off doing wonderful things at the frontiers of human experience. That’s a world I want to live in. Shame on us for not being there. If I ever had a means to tell stories of Gus Comet, the juxtaposition between his adventures and the mundane truths of our world would be at the forefront. Previoused: I am bad at reading.